Medical radiation calculator - how can I find the radiation dose? The numbers of medical imaging procedures using radiation have increased dramatically over the last two decades. Apart from the obvious benefits of those techniques - exceptional improvement in diagnosis, preventive medicine and screening - they also have some dark sides. Radiation-induced cancer risk and occurrence of health effects are two main reasons why these medical procedures can't be used unrestrainedly. 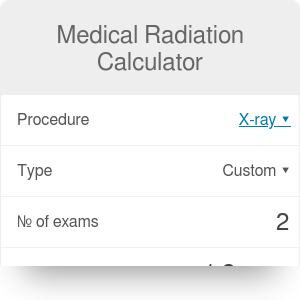 With our medical radiation calculator, you can check the effective radiation dose from standard medical procedures. Find out what is the x-ray radiation of your prescribed DEXA scan or what's the chest CT dose. The radiation doses in the calculator come from xrayrisk.com website. Nuclear medicine imaging is also called radiology done inside out - the small amounts of radioactive materials are injected, inhaled or swallowed and they emitting radiation from within the body. Nuclear medicine is using different types of ionizing radiation, such as gamma rays, beta particles, and alpha radiation. If you are wondering what it means that you get 5 or 10 millisieverts from your CT scan, check out the neat table below. The natural background radiation is estimated to 3-3.1 mSv/year. Now you know that a single spine CT gives you 7 mSv, and that it's the dose you would get from natural background radiation in 2 years. But how is it related to radiation-induced cancer risk? It's not an easy question, as a direct causality between medical imaging and increased cancer risk is still not proved. Scientists don't agree on which model should be used: linear no-threshold theory, which always considers radiation harmful, summing all minor doses linearly to one larger, or other approaches assuming that very small doses are harmless or even beneficial to our health. That's why we decided to omit the risk part which sometimes appears in charts or other tools. Our medical radiation calculator shows only the average effective dose for the medical procedure, its equivalent in natural background radiation and standard annual radiation dose. Choose the procedure. You can select between five popular medical imaging techniques, let's pick the CT scan as an example. Select the type of the procedure. Assume you will have a standard brain CT. Enter the number of exams. For example, you recently needed to have two CT scans. Your total effective dose is displayed. In the field below you can see the interpretation of the results. The total effective dose is compared to the annual average radiation dose for a US citizen and to the natural background radiation per year. Two CT brain scans from our example correspond to 64.52 % annual US average or 129.03 % annual natural background radiation. If you have any doubts or concerns about the risks of a procedure, talk to your doctor or a radiology technician. Remember that imaging centers and hospitals are trying to use doses as low as reasonably achievable - it's called the ALARA rule - and the benefits of accurate diagnosis almost always outweigh the risks and costs. Medical Radiation Calculator can be embedded on your website to enrich the content you wrote and make it easier for your visitors to understand your message.